Fickle Feline: Attempt #2: Buying Locally. I am pleased to report that my second attempt at buying locally was much more successful than attempt #1. It may have something to do with the fact that I took Cameron with me this time instead of Terrible-Two-Max, but it is more than likely due to the fact that July is a much better month for fruit and vegetables. Jennifer sent me the harvest schedule for Ontario and it made my mouth water a bit...especially August. Glorious August. 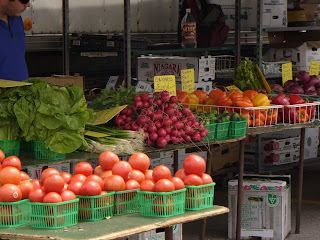 Today's bounty came via the weekly farmer's market at Oakville Place. For those that live around here, it's on Thursdays from 8am - 2pm. Needless to say, I was very impressed with the offering. I actually had to remind myself that I should only buy what we can reasonably eat in a week. The strawberries are so fresh you can actually taste them just by inhaling their smell. I tried to buy from as many different stands as possible, but I have to admit that I didn't quite get to everyone. The cheese stand was one I missed this week but plan to hit next week and there was also a butcher that had some appealing wares. The folks at the market probably thought I was nuts taking pictures, but I snapped away. 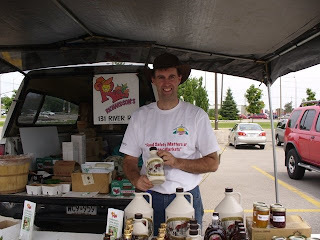 James Richardson from Richardson's Farm in Dunnville even let me take his picture. I liked that he thanked me for buying locally - very cool. I'll be sure to buy more from him next week. I also bought a lot of produce from Hillsview Greenhouses in Lucknow. 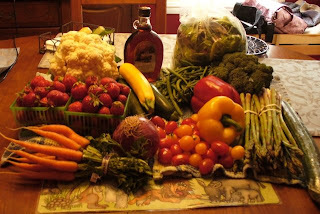 The haul this week included cauliflower, broccoli, green beans, asparagus (likely the last of it for this season), purple onion, peppers, cherry tomatoes, zucchini, greens, carrots, cucumber and maple syrup. Woot! Now I have to find room for all of this stuff in my fridge...or eat it...those strawberries may not make it to sundown. Looks fantastic! Good work! And it seems like you had fun, too. 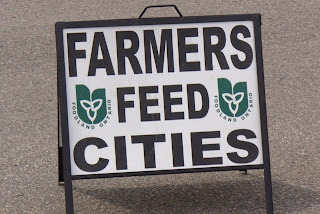 Yes - it feels good to know your food wasn't trucked across a continent ;-) I also like giving my money directly to the farmers instead of a middle man!